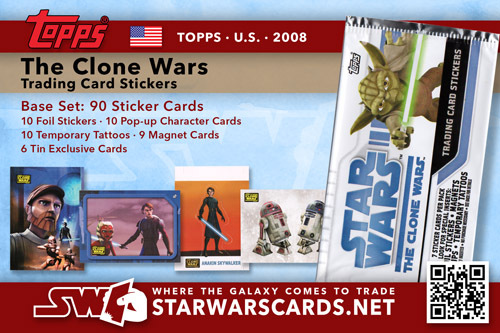 In keeping with the kid friendly nature of the Clone Wars film Topps has produced a set of Clone Wars sticker cards. These display in card sheets just fine, but for kids, these can also be peeled and used like any other sticker. Based on the film rather than the TV series, this sticker card set still attempts to take advantage of marketing for the TV show. A nice little set, there is nothing dramatic or new in these sticker cards and their lack of placement in retail outlets might hurt sales potential. The set begins with a number of character stickers (1-45). Set on colored backgrounds, characters strike standard poses and can be peeled off with only an outline of background color around them. Some stickers also include an emblem or logo associated to the character that can also be peeled. Characters are repeated in a variety of poses. Of special note in this grouping is sticker 45 which features R2-D2 with R2-KT. R2-KT is a pink droid specially created to commemorate the daughter of the founder of the 501st. Young Katie passed away after a long illness, but just as her memory is strong among members of the 501st fan group, Lucasfilm also honors her memory and the dedication of all fans through the R2-KT character. Stickers 46 through 90 are scene images. Each image is set within a blue border. The entire scene can be peeled away, leaving a shaped blue border. Because these cards show scenes from the actual film, they are generally darker in coloring. With only 45 cards, the selection of images is focused on moments of character close ups. I suspect fewer of these images will show up on kid's notebooks than will be the case with the first 45 stickers. In a demonstration perhaps that the stickers are intended to be stuck on things and not collected in albums, the three main sets of chase stickers each come in sets of ten. Awkward for placing in 9-card album sheets, but easy for kids to collect. As the sticker backs have no information on them for the chase stickers, I simply placed sticker 10 for each of these subsets facing out behind sticker 9 allowing it to be seen when I turn the page. The set of 10 foil stickers are large stickers featuring characters with either their name or an associated phrase. Dramatic poses and odd coloring are the highlights. A set of pop-up cards shows characters in poses, and is designed so you can pop out and fold the card to display the character with their associated background. Tattoos make up the next set of ten, featuring logos or character images intended to look good as a temporary tattoo. The first tattoo of R2 and 3P0 seems an odd choice, and yet the image, done with a hazy blue outline is terrific. Other tattoos are more in keeping with what you expect. A final set of chase cards are actually magnets. There are ten total magnets 2 each with blue, green, and orange borders, and 3 with red borders. Each magnet is a character image in close up. Suitable for a locker or a refrigerator. Magnets could be found at odds of roughly two per box. Thanks to Kristie for help in identifying known magnets. 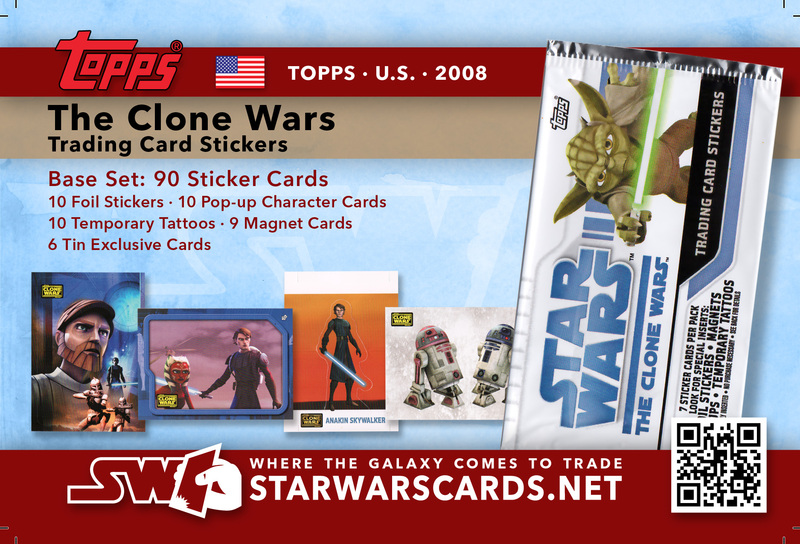 With one chase sticker in every pack, and nothing terribly exciting about the chase stickers, I'm not anticipating that they will have significant value above the regular stickers. The general lack of availability of the set as a whole however probably won't drive prices too high unless someone is a die-hard about finishing the set. Collation for the set was good, making the set easy to complete for those who found boxes for sale. 46 Safe..but for how long? 60 Freedom fighting isn't easy! 68 A padawan in need? 77 No way to travel! 6 of 10 Rex - Don't Mess With Rex!